(Note: This article originally appeared at Ricochet.com). In the bad old days, Big Tobacco would have used all the means at its disposal to thwart a new technology that threatened to disrupt the market for inhalable nicotine. But instead of using its relationship with (and leverage over) regulators to throw obstacles into the path of its early-worm competitors, Big Tobacco has read the writing on the wall and begun to supply the demand for e-cigarettes and vaporizers. One should expect a politically-connected colossus like R.J. Reynolds to arrive late to the e-cigarette game. But R.J. is downright nimble compared to a Ticonderoga-class bureaucracy like the California Department Of Public Health, which recently kicked-off a campaign to confuse low-information consumers (principally Millenials, liberals, and the poor). A website promoted by the state is called, tellingly, StillBlowingSmoke.org. See why those fine and ultrafine particles in e-cig aerosol are just tiny balls of evil to your measly human form. I guess you could say the e-cig industry comprises an evil empire. In targeting an effective smoking cessation device – vapor products – it is clear that the California Department of Public Health wants to maintain cigarette sales as an important funding source for their big spending priorities. 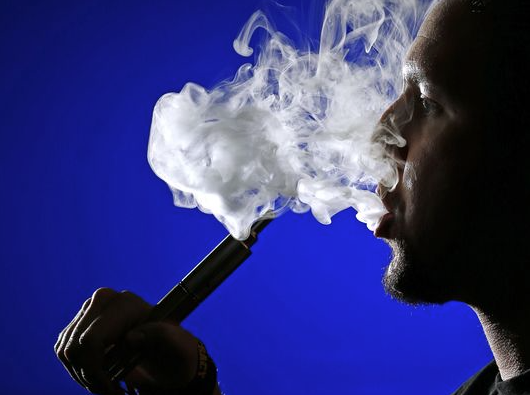 By discouraging vaping, the state may recoup potential revenue losses that occur when a smoker transitions from unhealthy cigarette use to products proven to be 99% less harmful, but not taxed as much. In short, Big Government’s interest in maintaining a robust supply of new cigarette smokers is every bit as mercenary as Big Tobacco’s. Return to www.daviDDeeble.com or see my two-year old’s greatest hits.